Is there such a thing as too much RGB lighting? That's debatable, but one thing's for certain, manufacturers are leaving no stone left unturned by putting multi-colour LEDs wherever possible. We've already seen graphics cards, motherboards, CPU coolers and RAM adorned with the stuff, and now storage solutions are joining the party. 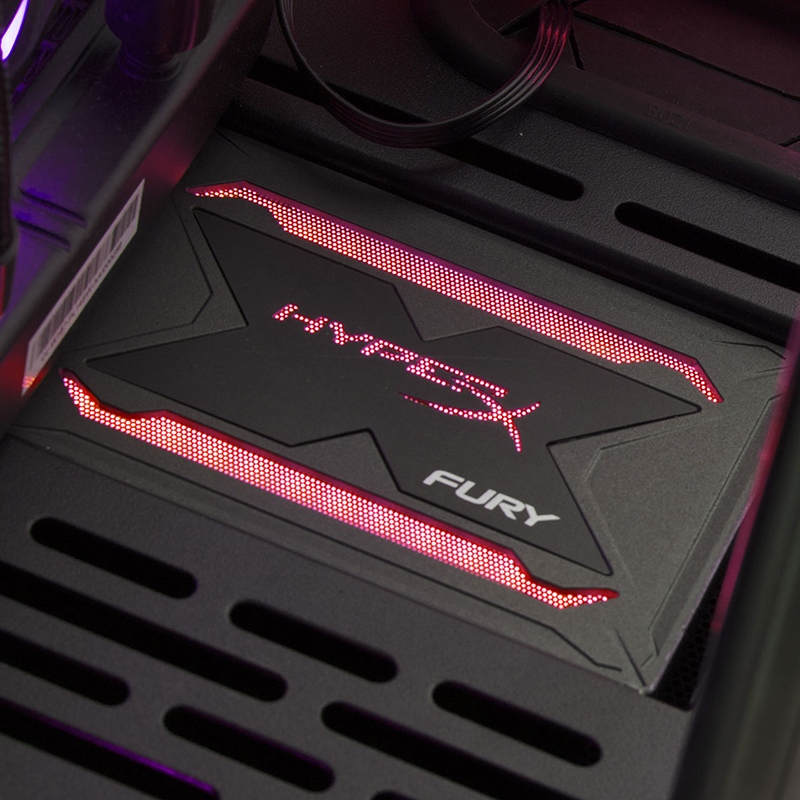 One of the first to bring eye-catching illumination to typically mundane disks is HyperX, whose Fury RGB SSD targets gamers and enthusiasts that enjoy a bit of bling. 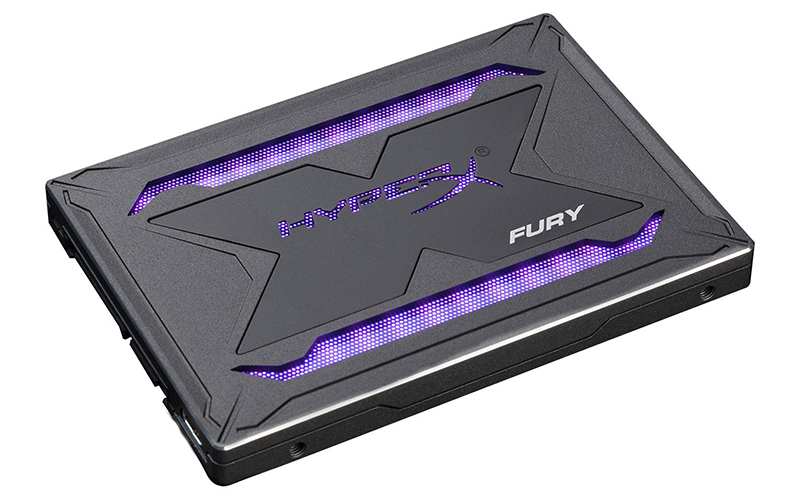 Adopting a familiar 2.5in format and available in 240GB (£70), 480GB (£115) and 960GB (£205) capacities, the Fury RGB doesn't attempt to make outlandish performance claims but instead promises "to give your computer a dash of dazzling RGB lighting." It isn't exactly a slow drive, but read and write speeds of 550MB/s and 480MB/s, respectively, are average by today's standards, and the Fury RGB is no match for the growing crop of PCIe competitors now on the market. Yet it kind of makes sense for HyperX to position the drive in this way. Ultra-fast M.2 drives are usually hidden beneath a heatsink on the motherboard, and if you're going to add RGB lights, they really need to be on a secondary drive that can sit in full view and offer a good amount of storage for your game library. In terms of specification, the Fury RGB SSD is fairly ordinary. On the inside, you're looking at a familiar Marvell 88SS1074 controller paired to 64-layer 3D TLC NAND and plumbed to a SATA 6Gbps interface. The drive is served in a 2.5in form factor measuring 9.5mm thick, and HyperX has write endurance over the course of three years rated at 120TB for the 240GB drive, 240TB for the 480GB, and 480TB for the 960GB. Neither speed nor endurance is outstanding, and for those who value peace of mind, it's worth noting that the Fury RGB is backed by a three-year warranty, while many competitors now offer five years of cover as standard. The SSD itself isn't ground breaking, so it's up to the RGB element to steal the show. From a visual perspective, the illumination does look pretty good, and so too does the all-grey metallic enclosure. This is a fine-looking drive, and for those who appreciate synchronised lighting effects, both the HyperX logo and strips either side offer good illumination. True, the lighting isn't perfectly if you get up close, but when viewed from a more typical distance, the combination of 75 internal LEDs and a white plastic diffuser sheet do a fine job of spreading the glow. There are caveats, however. Firstly, RGB lighting tends to mean more wiring, and HyperX does require a third cable in addition to power and data. The supplied RGB cable attaches to the back of the drive via micro USB and connects to any spare RGB header on your motherboard. Worth bearing in mind if you want to keep cabling down to an absolute minimum, though it's handy that the supplied HyperX cable is split at the RGB end, allowing for another device to be daisy chained with ease. Synchronisation with motherboards from all the major vendors is supported (Asus, MSI, Gigabyte and ASRock), and if you don't have a compatible board, the LEDs will glow red by default. Secondly, and more importantly, it seems the implementation of 75 LEDs beneath a diffuser layer hampers the drive's ability to keep cool. When installed in our test platform, idle temperature would hover around 45ºC, or almost double that of a Crucial MX300 inside the same machine. 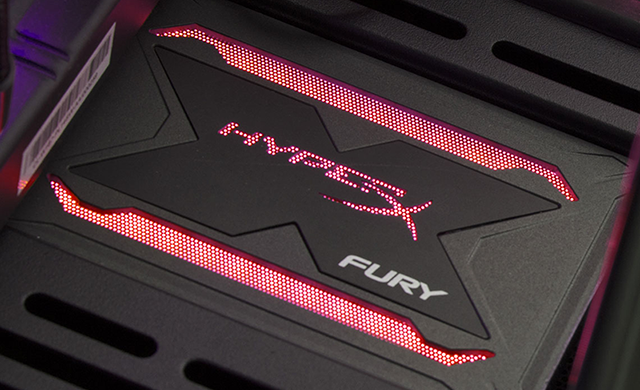 Under load the Fury RGB would nudge past 50ºC, easily making it one of the warmest 2.5in solutions we've tested, and though turning the LEDs off does reduce temperature, that's defeating the purpose. It's surprising to see such aggressive RGB illumination added to what is otherwise an entry-level SSD, and the end result is a price premium that isn't reflected in the performance of the drive. At the time of writing, our 480GB review sample is available for around £115. In comparison, a 500GB WD Blue using almost identical components fetches £72. SanDisk's Ultra 3D is even cheaper, at £64, and for those who have an M.2 slot at hand, it's easy to acquire a much faster NVMe drive for less than HyperX's £115 asking fee. Ever get the feeling you don't need to see the benchmarks to know there are more rational products out there? Let's not be hasty, we'll run through the benchmark suite before passing judgement.